Last Sunday Rob and I had a date night and, as we often seem to do here, we inadvertently stumbled on a fantastic cultural experience. 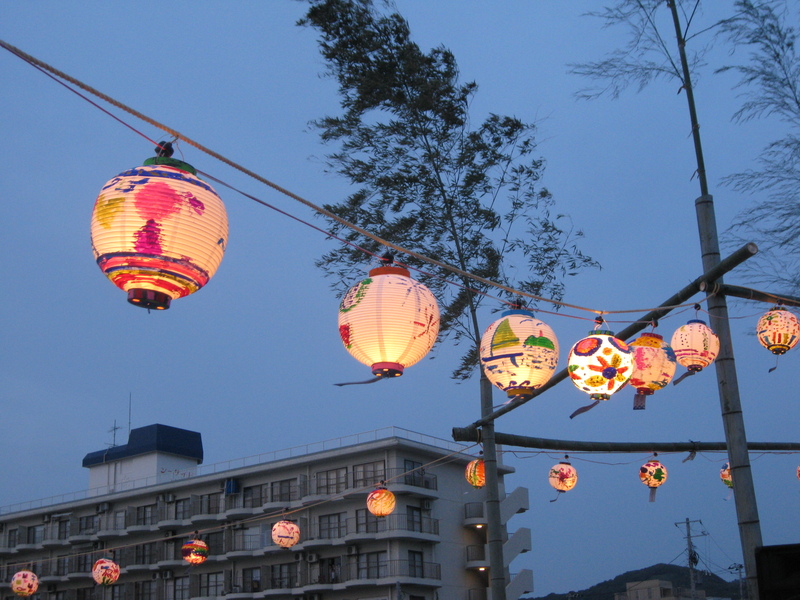 Unbeknownst to us, it was the festival of Bon Odori. We had gone to the beach to have a cocktail before going to the Royal Parasol Indian Restaurant (guess whose turn it was to pick the dinner location). 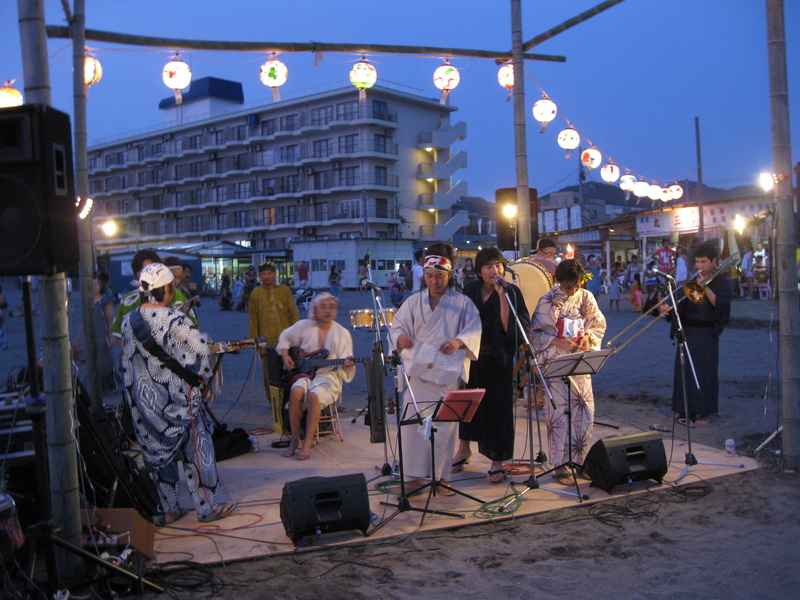 There we ran into some beach friends who told us about the festival, and the fact that there was going to be a very “Hayama-style” party for it on the beach. One of my beach friends explained the festival to me. Apparently all last week the ancestors of all the Japanese could come back home to visit. Then on Sunday, they had to go back to wherever they live now, so everyone throws a party to send them off. (She also told me that her husband is a Buddhist monk, which I think is so cool and makes total sense because he has always looked really serene.) 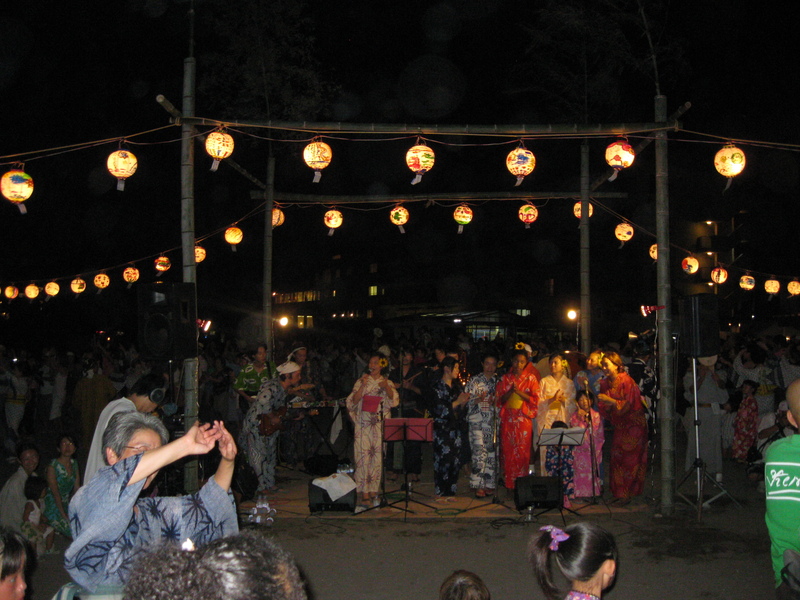 Anyway, farther down Morito Beach a stage was set up, strung with paper lanterns and surrounded by bamboo trees. 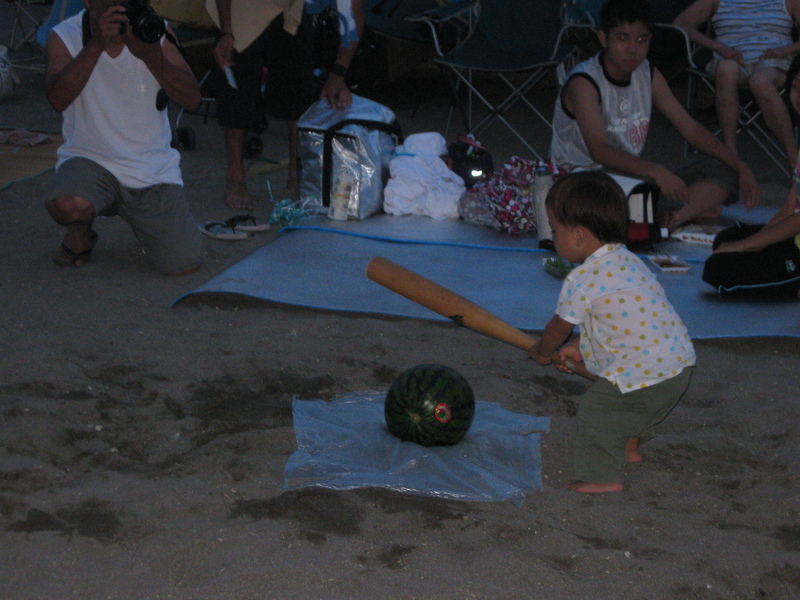 People were streaming down to the beach in their summer kimonos and doing festive things like smashing watermelons with baseball bats. All dressed up to dance. Good clean Bon Odori fun. Once it got dark, lots of people came to talk ceremoniously on stage and then they motioned us to take several big steps back. 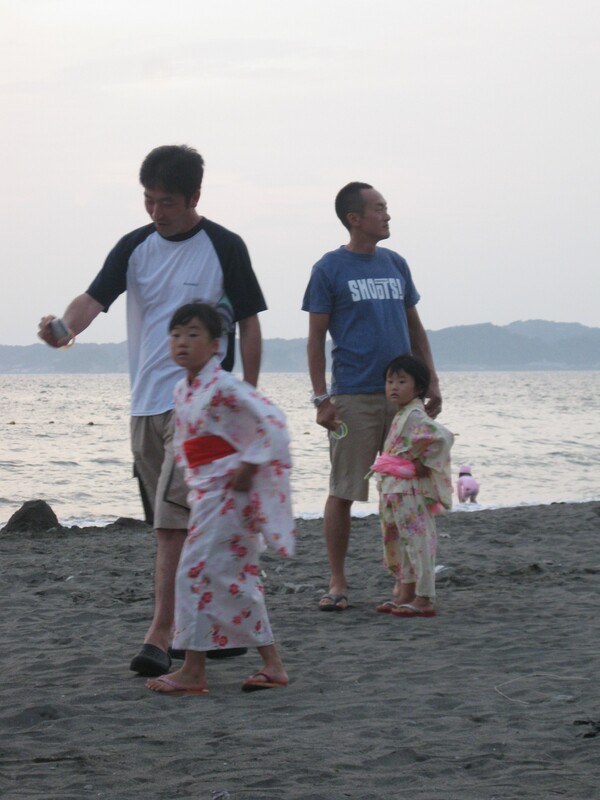 Rob and I had no idea what was going on, and out came about twelve diminutive older ladies in matching kimonos. They stood in a circle all around the stage and when the music began, they began to lead us in a dance around the stage! I love communal dancing, so I was thrilled. After a few minutes of just taking in the incredible spectacle of hundreds of Japanese singing and dancing under the lanterns in the warm night, Rob and I jumped in. The dances were simple and elegant, lots of pretty hand motions. The group-movement effect, and especially craning my neck to watch someone who knew what they were doing, reminded me of country line dancing. We saw lots of our neighbors in the dancing circle, nobody pointed at us for being the silly white people dancing (as far as I could tell anyway), and I really felt like a part of Hayama. I’m not sure if any of my ancestors had managed to visit in the past week, but we sure gave them a send-off just in case. The band warming up. Missing from the picture was the guy playing the traditional Japanese instrument, the Sapporo bottle. And much to Rob’s relief, we still made it to dinner. Curry and naan were enjoyed by all. So cool, Alden. I love thinking about you guys joining in one, big communal dance. Totally impressed by how adventurous you two are. Did Rob do the worm? Sadly no worm…I don’t think enough beer had been consumed. I was just way impressed that he was “dancing” at all. Sounds like a perfect night for a Rankin Taxi concert. On second thought, any night would be good for RT. I think RT might have been intimidated by the guy playing the beer bottle.